Aska is one of the key Lok Sabha constituencies of Odisha. The voting for the parliamentary polls 2019 on this seat will take place in the third phase on April 23. Presently, after the delimitation of parliamentary constituencies in 2008, the Aska constituency has seven Legislative Assembly segments - Polasara, Kabisuryanagar, Khallikote, Aska, Surada, Sanakhemundi and Hinjili. The seat is not reserved for any category and its constituency number is 19. Lok Sabha Elections 2019 Schedule: Voting In 7 Phases From April 11 to May 19, Counting And Results On May 23; Check All Dates For General Elections. The Biju Janata Dal (BJD) has fielded Pramila Bisoi from Aska, while, Anita Subhadarshinithe will contest on the Bharatiya Janata Party (BJP) ticket. However, the Congress has not fielded any candidate from this constituency. The last date of filing nominations for the seat was March 26. The scrutiny of nominations papers took place on March 27. Meanwhile, the last date of withdrawal of candidature was March 29. Lok Sabha Elections 2019 Phase II: List of States And Constituencies Voting On April 18. In 2014, Ladu Kishore Swain had won the seat on the BJD ticket defeating Congress' Srilokanath Rath with a massive margin of over three lakh votes. While, BJP's Mahesh Chandra Mohanty came at the third spot. The BJD had won all the Lok Sabha elections from this constituency since 1998. Meanwhile, before the splitting from the Janata Dal, BJD's founder Biju Patnaik had won Aska constituency in 1996, while his son and current Odisha CM Naveen Patnaik had bagged the seat on the Janata Dal's ticket in 1997. On March 10, the Election Commission of India announced dates for the 2019 Lok Sabha elections. The elections will take place in seven phases, and the results will be declared on May 23. 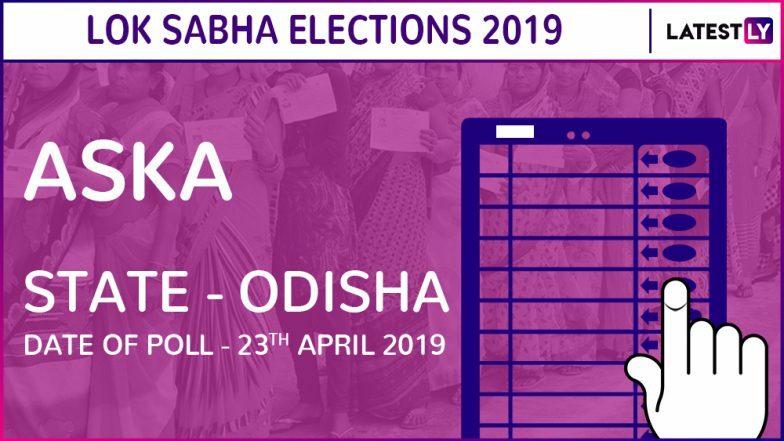 Along with Lok Sabha elections, the second phase voting for Odisha Assembly Elections 2019 will also take place on the same date.